The hardest part is to get started, but if you have a few words planned out, you can use the same ones over and over again. Mine are ‘Hi everyone! I’m Xandra Robinson-Burns…’. The same applies to everyday life. Here are some social scripts I use to avoid awkwardness, overcome social anxiety, and to just get started. Lead with a statement rather than a question makes me feel more confident and grounded. ‘I am interested in’, instead of ‘Can I?’ Or ‘May I?’. I’ve started to notice myself asking for something that I know the answer to. They’re plugging it into a computer anyway, and can usually turn the screen around for me to type myself. When at all uncertain as to whether a bathroom is occupied, I knock. For some reason, this one took a while to become habit. I used to feel so awkward and nervous approaching the door. Maybe a knock would be disruptive? When really, it’s more disruptive to rattle the door handle to see if it’s locked. And even more disruptive to try the door and find that it’s both occupied and unlocked! Instead of getting all worked about this, now I always knock, as politely as possible! Pause to process and to breathe. Don’t be so afraid of wasting people’s time. There’s no need to rush. Sometimes if I’m in a long queue and get to the front, I am flustered, and try to be quick to get out of there, and to progress the line along for the people behind me. Escape Rooms have taught me that rushing through something rarely actually saves time. We all know the one: when you’re walking down the street, and someone else is walking towards you. In general, I go with the road traffic: veer to the left in the UK, and to the right pretty much everywhere else. More importantly: instead of holding eye contact with the person heading in your direction, gaze in the direction that you want to walk. It’s like a turn signal with your eyes. Side shuffling avoided! Identify sticky social situations that keep coming up. What simple script or rule can you use to ease into them? 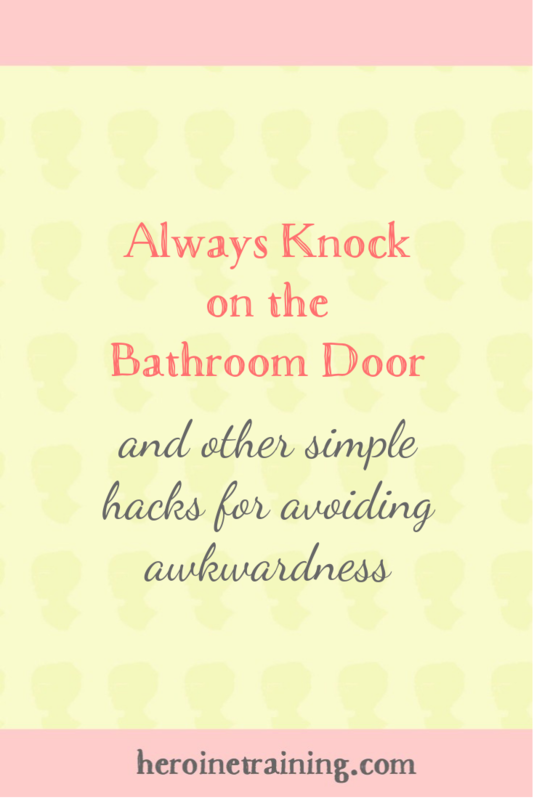 What social hacks do you use to navigate avoid awkwardness? P.S. Next week, I’m hosting a free class on bringing more meaning to your everyday life. Join me at Heroine Training 101!